, corresponding to amino acids 215-228 of Human DEDAF. 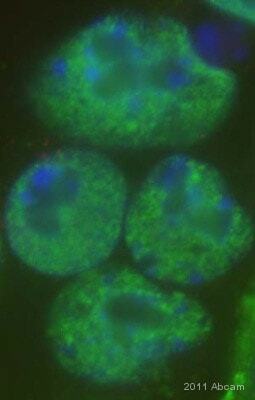 A549, HepG2 or 3T3 whole cell lysate. Apoptosis is related to many diseases and induced by a family of cell death receptors and their ligands. Cell death signals are transduced by death domain (DD) death effector domain (DED), and caspase recruitment domain (CARD) containing molecules. Several molecules including caspases and adaptor FADD contain DEDs. A novel protein that interacts with DED of caspase 8 and 10, and FADD was identified recently and designated DEDAF for DED associated factor. DEDAF is identical to the transcriptional repressor RYBP. DEDAF/RYBP is expressed in multiple tissues and cell lines. DEDAF interacts with FADD and augments the formation of CD95/FADD/capase 8 complexes at the cell membrane, and interacts with DED-containing DNA biding protein (DEDD) in the nucleus indicating it is involved in the regulation of both cytoplasmic and nuclear events of apoptosis. DEDAF Antibody is affinity chromatography purified via peptide column. Our Abpromise guarantee covers the use of ab5976 in the following tested applications. WB Use a concentration of 0.5 - 1 µg/ml. 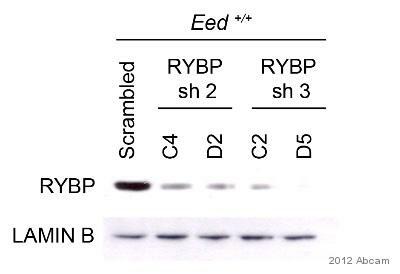 Detects a band of approximately 32 kDa.Can be blocked with RYBP peptide (ab6097). Can be blocked with DEDAF peptide (human) . IHC-P Use a concentration of 5 - 10 µg/ml. ICC/IF Use a concentration of 1 - 20 µg/ml. Western blot analysis of DEDAF expression in human A549 (lane A), HepG2 (lane B), and mouse 3T3 (lane C) cell lysates withab5976 at 1 µg /ml. Immunohistochemistry of DEDAF in mouse liver tissue with DEDAF antibody at 5 µg/ml. ab5976 staining RYBP in Mouse embryonic stem cells by ICC/IF (Immunocytochemistry/immunofluorescence). Cells were fixed with paraformaldehyde, permeabilized with Triton 0.5% and blocked with 1% milk for 30 minutes at 22°C. Samples were incubated with primary antibody (1/1000) for 1 hour at 22°C. An Alexa Fluor®488-conjugated Goat anti-rabbit IgG (H+L) polyclonal (1/400) was used as the secondary antibody. 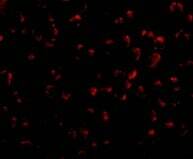 Immunofluorescence of DEDAF in A549 cells using ab5976 at 20 ug/ml. Publishing research using ab5976? Please let us know so that we can cite the reference in this datasheet. Worked with it before, one vial was brilliant, two showed unspecific signal. Tried than ab89603 Anti-RYBP antibody, no success either. Tried many optimazation steps for WB and IHC. Ich habe Rückmeldung aus dem Labor erhalten: Leider sieht es so aus, dass der ab128104 Anti-RYBP antibody [1B2] nur gegen das rekombinante Protein getestet wurde. Soll ich Ihnen daher (wie besprochen) den ab107896 Anti-RYBP antibody zukommen lassen? here is another try at sending the western with DEDAF. The attachment is a picture of the western blot using the DEDAF antibody. Used at a concentration of 0.5 ug/ml in IMR90 and HEP-G2 cells. Thank you again for sending the image of your blot. I contacted the originator of this antibody, and they have never seen that additional band at 60 kDa. You do seem to be detecting DEDAF as you are seeing a band at approx 32 kDa and most likely the band at 60 kDa is non-specific or perhaps a splicing variant or cross-reaction to another family member. The replacement vial is being shipped on order# 80151 and it will take approximately 1 week for you to receive it as it is currently out of stock. Please let me know how the replacement works out for you. Thank you for the details that you have submitted. From the description, it seems that you are detecting DEDAF at 32 kDa and are also seeing a non-specific band. I would suggest that you try decreasing the antibody concentration and/or the incubation period for both the primary and secondary antibodies. What were the results with the secondary-only control? Also, we do sell the blocking peptide for this antibody - use the blocking peptide to differentiate between specific and non-specific bands. Only specific bands should be blocked (and thus disappear). If you have any additional questions, please contact us again. Customer is using this antibody in Western blotting with 4 different breast cancer cell lines (MCF7 and MCF10A among them). He is seeing the expected band at 32 kDa, but is also seeing a band at approximately 60 kDa. Has this been seen before? Thank you for your phone call. I contacted the originator of this antibody and they were able to provide me with the following information. First, they said that with the A549, HepG2 and 3T3 whole cell lysates, they only observed a band at 32 kDa (there were no additional bands). Second, they have not tested this antibody in breast cancer cell lines, however, there may be a larger band in MOLT4 cells, but it is too faint to tell. I hope this is useful, if you have any additional questions please do let us know.